WASHINGTON – Baltimore residents now may get the opioid overdose reversal medication naloxone over the counter and a training requirement for its use has been removed, the city’s Health Commissioner said Thursday. 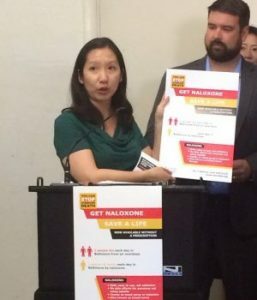 In October 2015, Baltimore became the first jurisdiction in Maryland to issue a blanket prescription for naloxone enabling Dr. Leana Wen, the health commissioner, to prescribe the drug for all of the city’s 620,000 residents. Wen said a new bipartisan law, the Heroin and Opioid Prevention Effort or HOPE Act, goes into effect Thursday that removes the previously required training to get naloxone, Wen said at a news conference. The training mandate created unnecessary paperwork that slowed outreach workers’ ability to reach more residents with the life-saving medication, she said. “In this time of public health emergency, we need every tool and must eliminate every barrier to save lives from overdose. That’s why we advocated for and supported this year’s bipartisan HOPE Act that treats addiction as the disease that it is,” Wen said. The health commissioner is urging all Baltimoreans to buy naloxone and have it on hand in case they encounter someone who has overdosed. “Naloxone is safe, effective, and easy to use. We must enable everyone to carry it and save lives,” she said. When Erica Hill on Headline News noted in an interview with Wen on Thursday afternoon that naloxone is pricey – costing about $150 for a two-dose pack – Wen said anyone on Medicaid can get naloxone for only $1 – or for free if they don’t have a dollar. The drug’s cost has soared in recent years. About 20,000 people in Baltimore use heroin and many thousands more misuse prescription opioids, according to the city’s Health Department. Preliminary data shows that there were 481 fatal overdoses from January through September 2016 and that deaths related to fentanyl – an opioid that is 50 to 100 times more powerful than morphine – increased nearly 20-fold in recent years. Since 2015, more than 23,000 Baltimoreans have been trained to use naloxone, Wen said, and those residents have saved more than 800 lives. “The HOPE Act will allow more people in Baltimore and across Maryland to have access to life-saving medications,” Mayor Catherine Pugh said Thursday in a statement. Drugstore chain Walgreens sells naloxone without a prescription in 33 states – including Maryland – and Washington, D.C. CVS sells the drug without a prescription in 14 states; Maryland is not included. On March 1, Maryland Gov. Larry Hogan declared a state of emergency due to the state’s heroin and opioid addiction crisis. He said at the time that deaths involving heroin and opioids had doubled in the state in the past year. Across the country, more than 52,000 people died of a drug overdose in 2015, and roughly two-thirds of them had used prescription opioids such as OxyContin or Vicodin, or illegal drugs such as heroin, according to the Centers for Disease Control and Prevention. Those overdoses jumped 33 percent in the past five years alone. Shortly after her appointment in January 2015, Wen declared opioid overdose a public health emergency in Baltimore and implemented a citywide plan to prevent overdose, increase access to treatment, and improve education for patients and providers. “Expanding access to naloxone is one concrete step we can and must take,” she said.